We’d love your help. Let us know what’s wrong with this preview of Lauren Ipsum by Carlos Bueno. No computers will be found in this book. If the idea of a computer science book without computers upsets you, please close your eyes until you’ve finished reading the rest of this page. The truth is that computer science is not really about the computer. It is just a tool to help you see ideas more clearly. You can see the moon and stars without a telescope, smell the flowe No computers will be found in this book. If the idea of a computer science book without computers upsets you, please close your eyes until you’ve finished reading the rest of this page. The truth is that computer science is not really about the computer. It is just a tool to help you see ideas more clearly. You can see the moon and stars without a telescope, smell the flowers without a fluoroscope, have fun without a funoscope, and be silly sans oscilloscope. 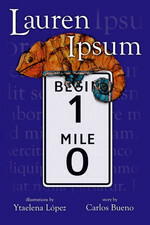 To ask other readers questions about Lauren Ipsum, please sign up. Sort of an Alice in Wonderland for computer nerds. Also had elements of Donald Duck in Mathmagic Land, except with better explanations of the algorithms used. In its best moments this book reminded me of The Phantom Tollbooth (quirky and thought-provoking with funny word play and turning of abstract ideas into entertaining characters and scenarios). Some of it felt more contrived than the Phantom Tollbooth, but it was overall an enjoyable read. My biggest complaint about the book is that the "guide" that helps the reader relate everything in the story to its reference point in computer science is located in the back of the book. Given that this book i In its best moments this book reminded me of The Phantom Tollbooth (quirky and thought-provoking with funny word play and turning of abstract ideas into entertaining characters and scenarios). Some of it felt more contrived than the Phantom Tollbooth, but it was overall an enjoyable read. My biggest complaint about the book is that the "guide" that helps the reader relate everything in the story to its reference point in computer science is located in the back of the book. Given that this book is supposedly for kids, I think this is a really misguided choice. Very few kids are going to even think of looking at the information in the guide as they read the story. They're just going to read the story and gloss over things they don't understand (which will be a lot because the whole object of the story is to introduce new terms and concepts)and thereby miss out on most of what they could learn (and very likely get bored and put the book down). The only way I could see this book really working for kids as-is would be if an adult who is already familiar with the computer science content read it with a child and took the time to explain everything, work through the little puzzles in the back etc. I really wanted to like this book more than I do. It is a mosaic adventure story in the tradition of Alice and The Phantom Tollbooth, and it does that well enough, but the emotional payoff at the end of the book just doesn't work. The book never quite makes you care about any of the characters. Instead, it's very invested in its ideas. There are some good ideas, and some great and terrible jokes... but without an emotional core to hold it together, it all just feels a bit flat. My son Sam was assigned this book for an honors Computer Science course at the UW. It is the closest thing I've ever found to one of my favorite kids's books - The Phantom Tollbooth. It follows a young girl through a fantasy land where she is introduced to computer science ideas (with no computers in the story at all) and solves problems to reach her goals. There are quirky characters and gratuitous puns. Very enjoyable. This book is basically The Phantom Tollbooth, but for computer science. I think the first time I tried to read it, I was too caught up in trying to understand every little nuance and how it related to computer science. I picked it up again today, and just read it a a story -- much more enjoyable! I even feel like I learned something! I was downloading the ebooks from my Kobo library and I found THIS! It gave me the kind of feeling you get when you come across an old favourite forgotten on a top shelf. True, it's only been maybe five or six years since I read this, but I'd quite forgotten about it. It's a lovely little book introducing computer sciencey concepts and ideas to kids. Yes, I already knew about the traveling merchant problem but it was fun to meet him anyway. An interesting tale about a girl who wanders into Userland and while reading about her quest to return to her home, the reader picks up concepts in Computer Science and Programming without ever encountering a computer (which is just a concrete application of Computer Science). Starting with meeting Jargon-like creatures that nearly overwhelm her, she meets up with the Travelling Salesman who directs her to a person who creates ideas which starts her on a journey delivering telescopes to various l An interesting tale about a girl who wanders into Userland and while reading about her quest to return to her home, the reader picks up concepts in Computer Science and Programming without ever encountering a computer (which is just a concrete application of Computer Science). Starting with meeting Jargon-like creatures that nearly overwhelm her, she meets up with the Travelling Salesman who directs her to a person who creates ideas which starts her on a journey delivering telescopes to various locations. Along the way, she picks up a Xor chameleon, meets Achilles and the Tortoise, encounters a recursive turning, learns the insecurity of passwords (including hacking one with a timing attack) and learns to program and solve problems for various people. She eventually finds her way back home after a journey through a binary tree. I adored this book. There, no beating around the bush for me. This books is very short, and a nice quick read, and surprisingly informative. It's about computer science and computer programming, without having a single computer in it. How do you do that? By showing the underlying principles. The basis of any computer programming is being able to apply logic and to break down complex ideas into simple ones. These are some of the principles that the book teaches. Like one of my most favorite books, I adored this book. There, no beating around the bush for me. Like one of my most favorite books, The Phantom Tollbooth, this book teaches you without being obvious. The main character, Lauren Ipsum, goes along on her adventures and learns lessons, and we end up learning right along side her. This was a really fun read - it's meant to introduce computer science concepts, without beating you over the head with them. I really enjoyed how the book had different layers - on the surface it's a story about a girl who gets lost and has to find her way home. But on the way she encounters a Travelling Salesman, Fencepost problems, binary decisions ... and a chameleon named XOR who doesn't blend very well with his surroundings. The more you pay attention, the more fun the details are. And there This was a really fun read - it's meant to introduce computer science concepts, without beating you over the head with them. I really enjoyed how the book had different layers - on the surface it's a story about a girl who gets lost and has to find her way home. But on the way she encounters a Travelling Salesman, Fencepost problems, binary decisions ... and a chameleon named XOR who doesn't blend very well with his surroundings. The more you pay attention, the more fun the details are. And there's a helpful appendix that expands upon key concepts. This book is absolutely brilliant. I try be critical in my reviews and put a lot respect into the rating system, reserving the 5 star spot for those only really deserving and valuable- trying to stay objective for books I know I enjoyed far more than it was worth. The logic puzzles Lauren encounters along the way use great real world examples to teach new concepts that force you to stretch your imagination when problem solving. Young readers should find the book easily approachable. It remains tim This book is absolutely brilliant. I try be critical in my reviews and put a lot respect into the rating system, reserving the 5 star spot for those only really deserving and valuable- trying to stay objective for books I know I enjoyed far more than it was worth. This book will probably be enjoyed by 2 types of readers: hi tech computer types or no tech fantasy fans. I guess I know enough tech stuff to notice some of the events/topics/characters are actually computer programming things but am annoyed by the tech parts I don't recognize. As a pure fantasy, it was too rambling and unconnected for me. Back matter has details on all the computer programming stuff. I loved this book. You can think of this book as Pre - "Structure and Interpretation of Computer Programs" i.e. book to read before you read SICP. It's really fascinating to read such a beautifully written book. It's a short book which you finish it in few hours. And I would say it is for everyone and anyone. Even if you are not into computer science, this book will talk about the bigger ideas which are applicable to any field. This was sold to me as a nice introduction to algorithms for kids. It's definitely Alice in Wonderland for ideas and algorithms, but the connection seems as tenuous as Alice in Wonderland teaching about non-Euclidean geometry. And it felt like just a large collection of in-jokes for people who already had a firm grasp on the material. Cute book with lots of hints at different computer science/programming things. It reminds me of The Man Who Counted, but without as many puzzles for you to do along the way. There are chapter-by-chapter notes at the end explaining some of the references. I may have tagged this as children-lit, but I can't really decide where this should go. It's not written lyrically, so an adult can't turn it into a read aloud. Yet, the child reading this book wouldn't be able to skim over parts they don't understand, as the whole point of the book is to Learn Something. The best thing to do would be to use this book as a discussion between an adult and a child as they read it together. Like Alice through the Looking Glass, this book aims to teach children abou I may have tagged this as children-lit, but I can't really decide where this should go. It's not written lyrically, so an adult can't turn it into a read aloud. Yet, the child reading this book wouldn't be able to skim over parts they don't understand, as the whole point of the book is to Learn Something. The best thing to do would be to use this book as a discussion between an adult and a child as they read it together. Like Alice through the Looking Glass, this book aims to teach children about a world very different than their own. Instead of the rules of chess, Lauren Ipsum looks at the world of logic and mathematics. As the author states, the words computer programming may be in the subtitle, but that's not what's really between the pages. In that sense, it is moderately successful. This review has been hidden because it contains spoilers. To view it, click here. "I feel I should warn you: You won't find any computers in this book. If the idea of a computer science book without computers upsets you, please close your eyes until you've finished reading the rest of this page." And so begins the book assigned to my 6th grader as one of his resources for his math class. It reminds me so much of one of my favorite books, The Phantom Tollbooth. Both utilize logic and questions and obvious statements to show just how little thinking we have become accustomed to "I feel I should warn you: You won't find any computers in this book. If the idea of a computer science book without computers upsets you, please close your eyes until you've finished reading the rest of this page." And so begins the book assigned to my 6th grader as one of his resources for his math class. It reminds me so much of one of my favorite books, The Phantom Tollbooth. Both utilize logic and questions and obvious statements to show just how little thinking we have become accustomed to doing. And it is an enjoyable ride of puns and riddles though the learning process. Computer science is not my strength. But I love a good book that makes me think without pretentiousness. This is it. The protagonist is a young girl who finds herself, Alice-like, in another world unlike the one she knows. She accepts truths and rebuffs them, is confused by their confusion and learns how to navigate in their language enhanced by her own powers of creativity, questions and savvy applications. I can see what Bueno was aiming for here combining an Alice In Wonderland like story with computing and computer science concepts. Unfortunately I don't think Lauren Ipsum delivers on that premise, with a fairly dry story, a plot that jumps from point to point without much interconnection and the descriptions of CS elements feeling very shallow, almost to the point of just name dropping at times. My favorite part was the appendix that worked through each chapter going into more details on the var I can see what Bueno was aiming for here combining an Alice In Wonderland like story with computing and computer science concepts. Unfortunately I don't think Lauren Ipsum delivers on that premise, with a fairly dry story, a plot that jumps from point to point without much interconnection and the descriptions of CS elements feeling very shallow, almost to the point of just name dropping at times. My favorite part was the appendix that worked through each chapter going into more details on the various concepts raised there. Adorable Alice journey set in the world of computer programming. You don't need to be proficient in programming logic to enjoy this quick read. Only a programmer would understand all the references, but it's written for beginners to enjoy. Plus, a lot of the concepts explored are explained at the end, anyway. I thoroughly enjoyed this book. Learnt some valuable computer science concepts too since this was taught to a child, it was very easy to grasp. The concepts share are foundational and it is presented in a neat, easy to understand manner. I internalized the importance of "naming", the thing with jargons and principle of 5-whys. Very helpful book. Essentially Phantom Tollbooth for computer science concepts. Generally thin plot and characters, and doesn't convey the concepts particularly well because the explanations are hidden in an appendix at the back of the book. The appendix doesn't even have the courtesy to be in chronological order (listed alphabetically). I did like the Jargon critters. Wysiwyg! Divertido, eso sí, llega un momento donde realmente quieres que dejen de abusar de los chistes, pero si asumes que está dirigido (tal vez?) a lectores que no conocen esos términos, como que te relajas. Igual, bonita, simple y tradicional historia con términos de ciencias computacionales. the girl called Laurie got lost and it is up to her to navigate herself through Userland. This book teaches you about some technological phrases and riddle like questions. A fun and quick read that I would approve for younger readers. I think it would be an enjoyable read even if it is only read for a fun aspect. It is a good way to introduce computer science jargon and a few concepts. miss a lot of the deeper contents. Computer scientists may not learn a lot new. Still, a fun read during a long train ride or flight. I have a feeling my rating will go up when I read it again. A creative venture into computer programming concepts. One will not close the book ready to code but it will get the reader in the mindset of problem solving.